“Teaching<insert subject field> is different” followed sometimes by “you wouldn’t understand” and “it’s hard to explain”. Musical pedagogy has a history steeped with pre-existing “norms” that are currently being pushed. Even “recent” Pioneer musical educators such as Kodaly(1925), Orff(1920’s), and Delcroze(1910’s) and even the Suzuki Method (1950’s) have fallen by the wayside unable to cope with the new way of thinking. Some teachers still cling to these values because they’ve worked in the past, but what could 21st Century teaching and learning do for or to music education? Have students create their own method books – compose their own short pieces to address a certain element of learning their instrument or musical concept. Skype symphony – might be tough with latency issues – although Peavy has software out there that almost eliminates latency and allows simultaneous jam sessions! Most of these ideas will take more time than I have to implement – plus I havn’t weighed the value that they would have v.s. the time to work them through is. 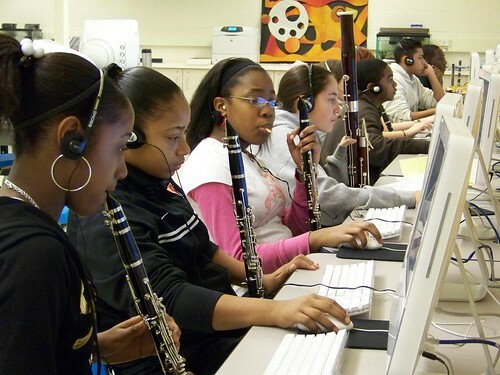 I see much more value in a class full of flutes and tubas than just a lab of macs running garageband loops. The collaboration and communication that can happen with a single gesture, or glance, or nuance of a note without even a word spoken has so much power and is lacking these days in general let alone the education world. Can I have both? I want a trombone player that can take a tablet out in the hall and play a passage he or she’s having trouble with, and post it to soundcloud and get feedback from peers, me, and the rest of the world. Who knows, someone might sample their recording and make something else that makes a million dollars! A music program is like life, it needs balance, and until I find just the right weightings and more than a year in one school, I’ll keep doing what I’m doing. Haven’t had many complaints yet!